The traditional method of detecting fog/low stratus is the brightness temperature difference between the shortwave (3.9 µm) and longwave (10.7 µm) infrared channels on GOES. This identification scheme is based on the fact that water droplets do not emit shortwave radiation (3.9 µm) as a blackbody; because of that, the amount of shortwave radiation detected by the satellite is less than it would be if blackboard emissivity were occurring, and the inferred temperature (computed assuming blackboard emission) of the emitting cloud is therefore colder. Water droplets do emit longwave radiation more like a blackbody, so the 10.7 µm brightness temperature is warmer. If the satellite view of low clouds is blocked by cirrus, as above, or by mid-level clouds, then satellite detection of low clouds/fog is hampered or impossible. In the animation above, there are many regions of near-IFR or IFR conditions — low ceilings and reduced visibility — where the Brightness Temperature Difference Product gives no indication that fog/low stratus exists. GOES-R IFR Probability fields, above, better capture the horizontal extent of the low ceilings and reduced visibilities. This is because surface data is incorporated into the fields via output from the Rapid Refresh Model output. IFR Probabilities are heightened where the Rapid Refresh Model shows saturation (or near saturation) near the surface, and that includes regions under high/middle clouds, such as the Red River Valley between Minnesota and North Dakota. That model data are controlling the value of the IFR Probability field in those regions is apparent because of two things: (1) The field is horizontally uniform, and not pixelated as it is in regions where higher-resolution satellite data can be used; (2) IFR probability values are smaller because there is less certainty that low clouds are present because the satellite cannot detect them. A well-trained user of this product, then, will interpret IFR Probability values of around 50-60 percent differently in regions of high clouds vs. in regions where low clouds only are present. Note the obvious line in the fields at 1415 UTC — the last image in the animation. This is the boundary between night-time predictors (to the north and west) and daytime predictors (to the south and east). Generally, IFR Probabilities increase as the sun rises because visible satellite data can be used to distinguish between clear and cloudy skies. If there is more certainty that clouds exist, then IFR Probabilities will be greater. MODIS and Suomi NPP overflew this region and provided information about the clouds. GOES-R IFR Probability is not yet computed using Suomi NPP data; the brightness temperature difference product (11.35 – 3.74), below, shows the widespread cirrus over the region during two sequential overpasses. Scattered breaks allow identification of low clouds. As with any brightness temperature difference product, however, the information is about the top of the cloud, not necessarily the cloud base. Aqua MODIS estimates of fog are shown below at 0728 and 0907 UTC. Detection using the Brightness Temperature Difference field is hampered by cirrus clouds. IFR Probability fields identify regions under cirrus that show IFR conditions. This entry was posted in MODIS, Multiple Cloud Layers, Northern Plains, Suomi/NPP on January 28, 2015 by Scott Lindstrom. The imagery above shows a stratus deck stretching from Wisconsin and Missouri to New York. Both MODIS and GOES Brightness Temperature Difference fields show strong returns that suggest the presence of stratus clouds comprised of water droplets (owing to the difference in emissivity from small droplets at 3.9µm and at 10.7µm). But what about the cloud base, a parameter that is very difficult to determine from satellite data alone? IFR Probabilities suggest differences in the cloud bases. Highest probabilities are over Wisconsin — where ceilings are around 1000 feet, and where fog is reported (at Lone Rock). Over Indiana and Ohio, IFR Probabilities are low, and ceilings are generally above 2000 feet. IFR Probabilities are higher over Pennsylvania and New York, where ceilings drop again to 600-1000 feet, and where fog is again reported (At Dubois). The inclusion of surface moisture information (from the Rapid Refresh Model) in the IFR Probability fields allows the IFR Probability fields to better distinguish between low ceilings/fog (known transportation hazards) and higher ceilings in regions of stratus where satellite data alone shows little difference. This entry was posted in Midwest, Multiple Cloud Layers on January 23, 2015 by Scott Lindstrom. 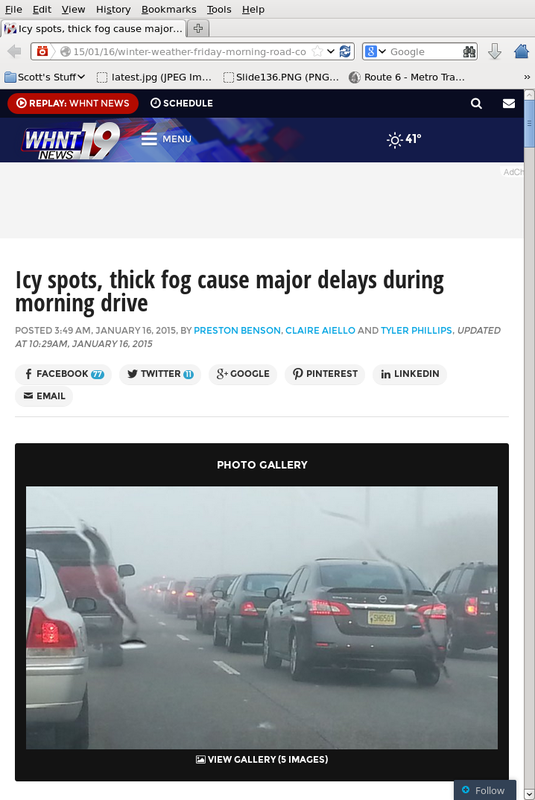 Dense fog developed over the Tennessee River Valley during the morning hours of 16 January 2015, causing crashes and traffic and school delays. The screenshot above (from this link), from WHNT in Huntsville, shows the conditions. IFR Probability Fields, below, show a large stratus deck moving southward over Alabama, moving south of Hunstville by 0700 UTC. Clear skies allowed additional cooling and a radiation fog developed. The fog impeded transportation in and around Huntsville. IFR Probabilities increased around Huntsville after the large-scale stratus deck moved out, and remained high until around 1500 UTC when all fog dissipated. IFR Probability fields are computed using both satellite data and Rapid Refresh Model data. That IFR Probability is high over Huntsville and surroundings as the fog develops says that satellite data suggests water cloud development and that model data suggests near-surface saturation. The fog was also diagnosed using traditional detection methods, such as the brightness temperature difference field from GOES-13 shown below. Brightness Temperature Difference fields detect both fog and elevated stratus, and it’s difficult for satellite data-only products to distinguish between the two cloud types because no surface information is included in a simple brightness temperature difference field. For a small-scale event such as this, polar orbiting satellites can give sufficient horizontal resolution to give important information. MODIS data from Terra or Aqua can be used to compute IFR Probabilities, and a toggle between the MODIS brightness temperature difference field, and the MODIS-based IFR Probabilities at 0704 UTC is below; unfortunately, Terra and Aqua were not overhead when the fog was at its most dense, but a thin filament of fog/High IFR Probability is developing south of Huntsville in a river valley. Suomi NPP was positioned such that northern Alabama was viewed on two successive orbits, and the toggle below shows the brightness temperature difference field (11.35 – 3.74). Similar to GOES, Suomi NPP Brightness Temperature Difference fields show the development of water-based clouds in/around Huntsville. This entry was posted in Deep South, MODIS, Southeast, Suomi/NPP on January 16, 2015 by Scott Lindstrom. Fog and low stratus has persisted in California’s central valley during the week of 12-16 January 2015. The visible imagery above shows the extent of the fog/low stratus at 1800 UTC on 12-15 January. During the early morning hours of 16 January, high cirrus started to overspread the central Valley (That cirrus is apparent in the visible iamgery from 15 January above). The presence of cirrus makes use of the traditional method of fog detection — brightness temperature difference — problematic because the satellite no longer senses radiation from the low clouds; rather, cirrus radiation is being detected. The four toggles below show Brightness temperature Difference and GOES-R IFR Probabilities at 0300 (top), 0700 (second from top), 1100 (second from bottom) and 1400 UTC (bottom) on 16 January 2015. At 0300 UTC, cirrus has overspread the northern part of the central Valley. At this time Merced, CA, shows IFR conditions. IFR Probabilities under the cirrus there show a flat field characteristic of conditions when IFR Probabilities are governed by Rapid Refresh data only. Probabilities are higher where satellite data are also included as predictors. At 0700 UTC and 1100 UTC, cirrus has overspread the entire valley (with occasional breaks). Values of GOES-R IFR Probability are therefore suppressed, so interpretation of the IFR Probability value should be tempered by knowledge of the cloud field. A low value under clear skies means something different than a low value under a cirrus canopy. Under a cirrus canopy, the accuracy of the GOES-R IFR Probability Field depends on the accuracy of the Rapid Refresh model. AT 1400 UTC, as the cirrus shield retreats, IFR Probabilities increase again over the central Valley. This entry was posted in California, Multiple Cloud Layers on January 16, 2015 by Scott Lindstrom. High Pressure over the Rocky Mountains, and its associated inversion, has trapped moisture at low levels, including along the Snake River in southern Idaho. As a consequence, fog is prevalent at low levels, and cold temperatures are allowing for the development of freezing fog. (Click here for a National Weather Service advisory from the Pocatello WFO). The GOES-R IFR Algorithm shows high probabilities over the Snake River Valley where the Fog/Freezing Fog was occuring — Twin Falls and Rexburg both reported freezing fog during the animation above. The Brightness Temperature Difference field, below, also captures the areal extent of the low stratus deck. This entry was posted in Rocky Mountains on January 14, 2015 by Scott Lindstrom.